AHCC & Lyme Disease Study - 8/31/2017 - by Dr. Salerno ? Healthline - 5/11/21017 - Does the Alternate Day Fast Really Work? Well + Good - 3/4/2014 - Could an At-Home IV Cure Your Health Issue (or Hangover)? Glitter Magazine - Fall 2014 - Health 101: Get that Bikini Body in No Time Flat! 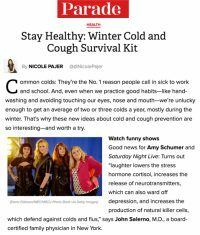 Chicago Health - 06/02/2014 - MERS: What Is It And What It Means For The U.S.
OnFitness Magazine- - May 2014 - How Much Protein Should A Very Active 65-Plus Individual Eat? KWWL - April 2014 - Harsh Winter Means More Allergy Season Suffering - Find out how you can avoid this years "pollen vortex" from the expert himself - Dr. Salerno. All Parenting - Pros and Cons of the Bee Pollen Diet - 4/23/2014 - Dr. Salerno speaks about the fast weight loss results women are getting with the bee pollen diet. Before you jump on this popular trend, make sure you're aware of the potential pros and cons. Women's Health - Study: Saturated Fat May Not Cause Heart Disease- 03/18/2014 - A new meta-analysis published in the Annals of Internal Medicine shows saturated fats don't increase the risk for heart disease. Women's Health - What's the Deal with Oil Pulling? - 03/18/2014 - Dr. Salerno explains how swishing with oil is a great way of ridding your mouth of bacteria-if you can bear the brutal 20-minute sessions. Daily Makeover - Toxins in Your Beauty Products? 8 Things To Know Now - March 2014 - Most women use cosmetics every day, but how natural are they? Ingredients, fragrances, and industry staples could be making us look great, but ultimately feel sick. 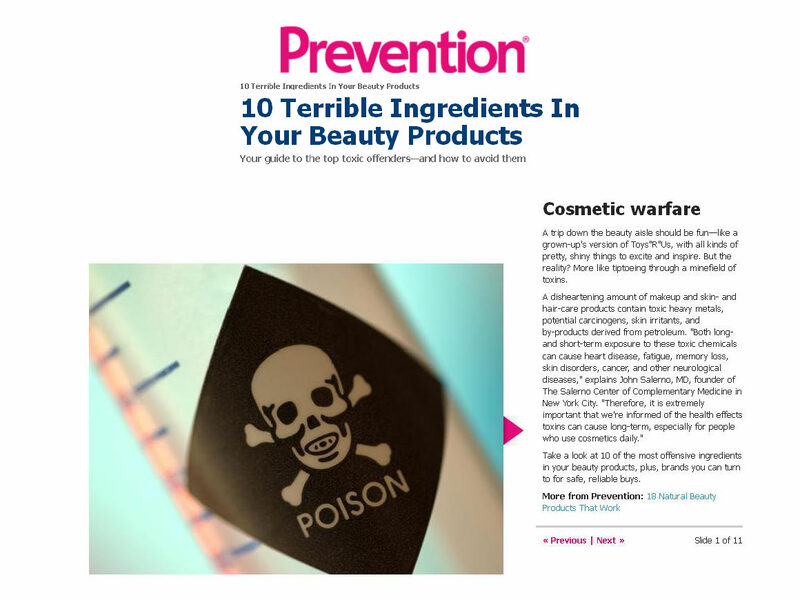 Prevention.com - 10 Terrible Ingredients in Your Beauty Products - March 2014 - Dr. Salerno elaborates on the hidden dangers of popular makeup, skin, and hair-care products. Harper's Bazaar - The Case For Injecting Your Vitamins - 02/10/2014 - To choose the perfect vitamin cocktail for your needs, Dr. Salerno explains how an easy-to administer blood test can gauge levels of various nutrients and see where exactly you're deficient. 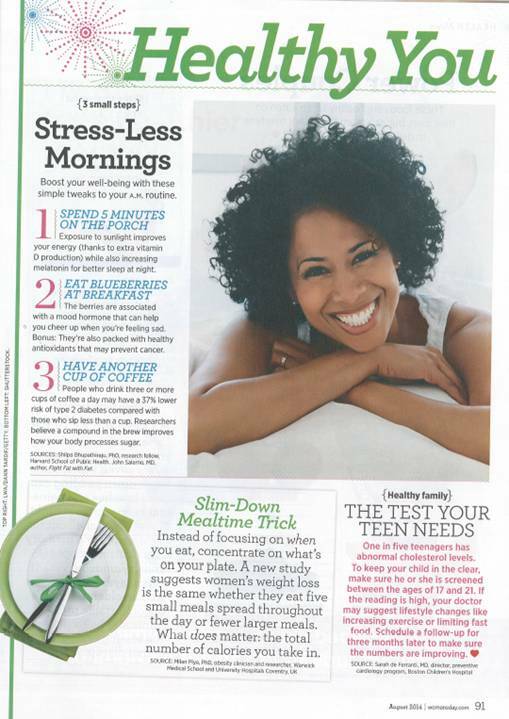 Main Street - Why Taking a Lunch Break Can Boost Your Career - February 2014 - A lunch break is important for your physical and mental health. Find out how skipping a much-needed midday break might actually have the opposite effect by wearing you out. Natural Awakenings - Sugar Monster - September 2013 - The dangers of excessive sugar consumption are rampant in society, but what foods are the worst offenders? Find out how you can avoid the common pitfalls of hidden sugars and, if addicted, what you can do to make healthier choices. Personalized Medicine Universe -System lupus erythematosis and mercury toxicity - July 2013 - This case study examines the relationship between heavy metal toxicity and its influence on auto immune disease. Personalized Medicine Universe - High dose IV vitamin C for treatment of prostate adenocarcinoma - July 2013 = A case study of a patient who has diagnosed with prostate cancer of Gleason's pattern 7. At the end of observation and treatment plan with high dose IV vitamin C, the vascular tumor that was present before on the left mid-gland area of the prostate was no longer detectable on the ultrasound. NewsMax Health - Kiss Of Death? Toxic Metals Found in Lipstick - 05/23/2013 - Dr. Salerno, who happens to test many of his own female patients for heavy metals, explains how lipstick and other popular cosmetics expose individuals to lead, arsenic, cadmium, aluminum, and other dangerous metals. NewsMax Health - Can You Fight Fat by Eating Fat? - 05/13/2013 - Can you lose weight by eating fatty foods? Dr. John P. Salerno, board-certified family physician and protégé of Atkins Diet creator Dr. Robert Atkins,explains how eating the right kinds of fat can lead to a healthy weight. NewsMax Health - Chris Christie's Weight Surgery. Fit For Presidency? - 05/7/2013 - Dr. Salerno comments on New Jersey Gov. Chris Christie's decision to undergo secret weight-loss surgery, and how his health may impact the future of his campaign for the White House. Hardbody News - FAQ's About A Low-Carb Diet - 2/16/2013 - In this article, Dr. Salerno, board-certified family physician and pioneer in the realm of all things low-carb, explains his diet strategies and techniques that have helped thousands lose weight and stay disease-free. Yahoo - 'Silver Cloud Diet' Fights Bad Fat With Good Fat - 1/28/2013 - Dr. John Salerno, protégé of the late "Atkins Diet" creator, Dr. Robert Atkins, corrects misconceptions about the science of nutrition and losing weight while addressing current state-of-food issues in his new book, "The Silver Cloud Diet". 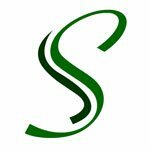 Champagne Living - Rethinking Atkins - 1/7/2013 - Read Dr. Salerno's interview on how hidden sugar, preservatives and highly processed starches can cause disease and rob you of vital energy, plus what you can actually do about it. The Power Player Lifestyle - Fighting Fat With Fat: Update on Atkins Diet - 12/14/2012 - Since the initial popularity of the Atkins, Dr. Salerno's food low-carbohydrate diet, Fight Fat With Fat, has been making headlines. Find out how low-carb foods are the answer to good health, and how healthy saturated fats can combat disease. Champagne Living - Rethinking Atkins - July 2012 - Read Dr. Salerno's interview on how hidden sugar, preservatives and highly processed starches can cause disease and rob you of vital energy, plus what you can actually do about it. News Advertiser - FAQ on Low Carb Diets with John Salerno - July 2012 - Dr. John Salerno – a protégé of “Atkins Diet” creator Dr. Robert Atkins –speaks about the health epidemic that's sweeping the country and how a low-carb meal plan can balance weight, reduce chronic disease, and slow aging. 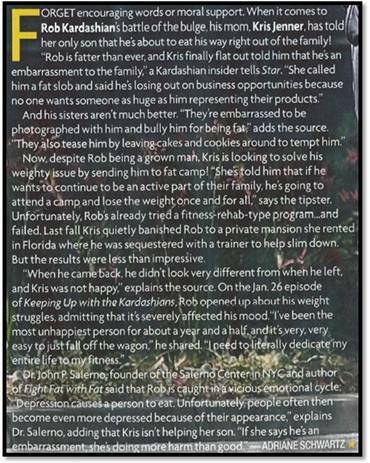 Star Magazine - Kris Tell's Rob: You're A Huge Problem!